Politicians who go along with increasing the predatory activities of the State Leviathan can get away with murder. They can use the State to enrich themselves despite blatant conflict of interest, tell hundreds of lies to the public, and engage in other crimes that would result in imprisonment if committed by mere mortals. The corporate press and (of course) the State turn a blind eye to the minions of the monster. On the other hand, politicians who seek to make the State less lethal find themselves subject to attack at every turn. This is the predicament of freshman senator Rand Paul, who has much more often than not tried to do the right thing and pry the claws of the State off the throat of the American public. Establishment Republicans spurn him and the press attacks him at every turn. The latest attack, which has actually forced Paul to take significant defensive measures, involves allegations of plagiarism. Transiting Chiron conjunct natal Jupiter: wounding which requires healing and adjustment (Chiron), applied in the areas of publishing and public relations (Jupiter). Transiting Saturn conjunct natal Neptune: challenges and difficulties (Saturn) with image (Neptune). Transiting Mars conjunct natal Pluto: external attack (Mars) upon one's power (Pluto). Libertarians who are paying attention know this event to be an attack by the powers that be and not a career-killing revelation of wrongdoing. Astrology reinforces this view. 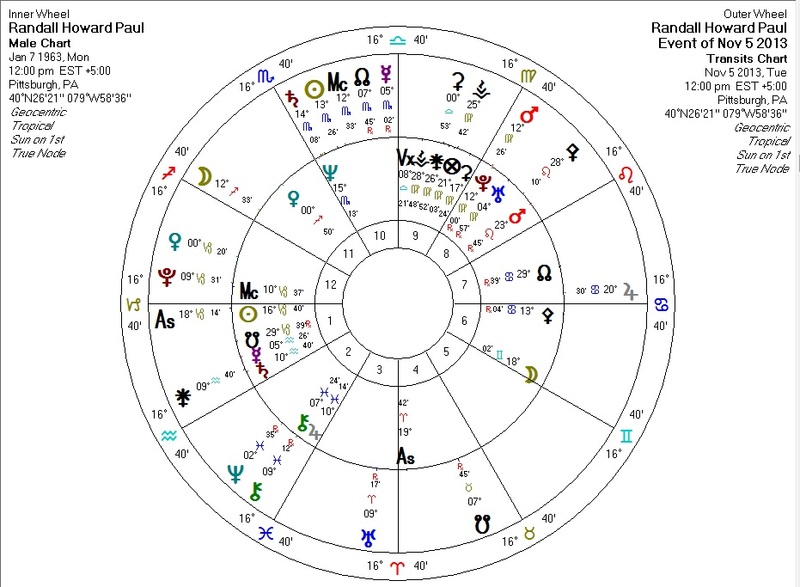 The "big one" for Rand Paul is probably in 2016 when transiting Pluto conjoins his natal Sun. This has implications for a presidential run, which we may discuss in a future post.